1.Prepare the filling for the tiropita. Use a fork to crumble the feta cheese into a large bowl and add the beaten eggs along with the rest of the grated cheese and milk cream. Chop some fresh mint and add to the mixture. Season with freshly ground pepper and blend well with a spoon. Place the mixture in the refrigerator for 20-30 minutes. 2.Use a large baking tray, approx. 20*30 cm. By using a pastry brush, butter the bottom and sides of the tray. 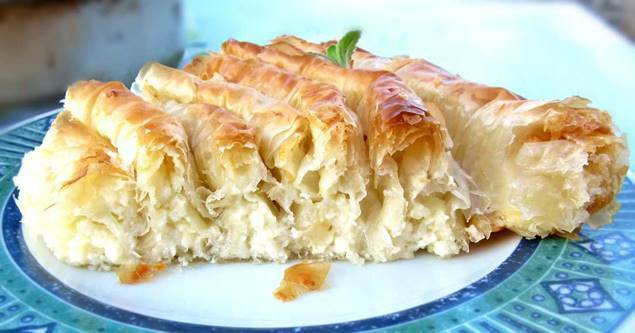 Place one sheet of phyllo at the bottom of the pan and with a cooking brush sprinkle some olive oil or melted butter. Repeat the procedure, adding 4-5 more sheets of phyllo dough. You will use 5-6 phyllo sheets for the bottom of the tiropita. 3.Pour in the feta cheese mixture and smooth with a spatula. With a knife trim some of the excessive phyllo, and fold the excess phyllo sheets flaps over the mixture. Top the tiropita with 4-5 more phyllo sheets, making sure to oil or butter each one, before adding the other; roll in the edges. Brush the top with oil or butter, sprinkle with water and sesame seeds. If using commercial phyllo dough to make this tiropita recipe make sure to scar the top with a sharp knife, to help release the steam. 4.Bake the tiropita in a preheated oven at 180C for 45-50 minutes, until the phyllo is crisp and golden. Let it cool down for a while before serving. Enjoy!